On my daughter’s first Earth Day and the promise in a world of cities. John Judge, ceo of nation's oldest conservation org, Appalachian Mountain Club. Working to get people active in the outdoors and conservation. Tweets are my own. This is the first Earth Day for my daughter who is nearly 11 months old. 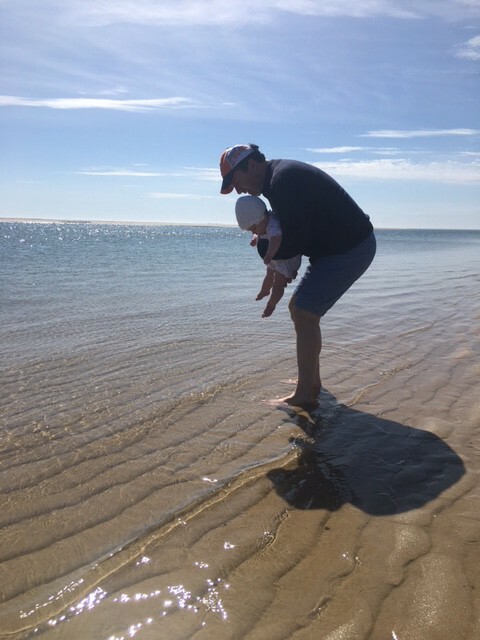 As she takes her first steps, puts her toes in the waters of our oceans or simply revels in the natural world around her, I think about this time as one of challenge and opportunity for the outdoors. How can we best work today to make sure the future is centered on the outdoors? Connections with nature will be even more critical in a world of augmented reality, virtual reality and artificial intelligence. While nature is part of everyone’s DNA, today’s trends are against us and for us. Tantamount to our future success will be our ability to engage our world of cities in the outdoors and conservation stewardship. The steadying effect of the outdoors will be indispensable for cities. From economic development, community engagement, youth development, resiliency, learning and sustainability- connecting to the outdoors can help advance the community as a whole while contributing to individual well being. The new urbanist needs to get his or her hands dirty, so to speak, through the outdoors, nature and conservation. To move ahead we need to foster outdoor citizenship and outdoor cities. Simply put, Outdoor Citizenship is a commitment to an active outdoor lifestyle and a life of conservation stewardship, a way to combat rising consumption, stepping up conservation by stepping into the outdoors. Outdoor Citizens are the people who move and make things happen — who will help us to think differently about the outdoors. First by engaging and preparing citizens with outdoor capabilities; and second, by aligning city and societal challenges and infrastructure needs with new incentives and resources. In doing so we will create a dynamic new generation of Outdoor Citizens and Outdoor Cities. As 21st Century outdoor citizens, conservation must be woven into our habits and daily lives. My parents were born in the late 1920’s and early 1930’s. They were inculcated with a scarcity mentality when it came to our natural resources — a depression era conservation ethic. Using less, recycling more and stretching one’s dollar are all part of that depression era thinking. As we tackle climate change and the realities of diminishing natural resources, it is time for us to adopt this depression era conservation ethic. Conservation will only get us so far. While most of the uber-consumers live in the more affluent developed world, a burgeoning middle class made up of billions of more consumers, is emerging in Africa, Asia and South America. With the advent of more global energy use, we need to continue to harness conservation to lower green house gases and resource depletion, but also work to think out of the box for other opportunities. While we desperately need to conserve, it will only get us part way there. We will need to invent and innovate to create the solutions that will tackle climate change and protect the planet. While technology and screens may present threats to the time we spend in the outdoors, this new digital age presents us with a growing set of connected devices to support our planet in a new way. Some 1 trillion digital devices are predicted by 2025. From smart phones and the internet of everything, we have an opportunity to foster innovation that will help each of us take responsibility for personal energy use, gather real time scientific data, learn from best practices, while globally aggregating the positive impact. The only way we are going to succeed is by involving everyone: there is a moral imperative to make the outdoors open, inclusive and accessible to everyone. Unless we connect the outdoors with under served communities, communities of color and populations typically underrepresented in the outdoors, we cannot realize our vision of global connectedness with nature and with each other. Let’s work to make each Earth Day on record as better than the last. On this Earth Day I hope and pray for our generation to lead with a renewed passion and purpose, and to pass that love of the outdoors and a healthy planet to my daughter, your daughters and sons, grandchildren and successive generations…for a globally engaged community, working together, can help insure cleaner air, cleaner water, green investments, and increases in outdoor recreational participation. That will be a true celebration of life to the fullest on this beautiful planet. The Dalai Lama, A Royal, A Billionaire and a Gangsta Gardener.